The first scientific research expedition in contemporary Russian history on the trail of the famous explorer and scientist-humanist, Nikolai Nikolaevich Miklouho-Maclay, took place on September 13-25, 2017 in Papua New Guinea. Today it has gone down in history. 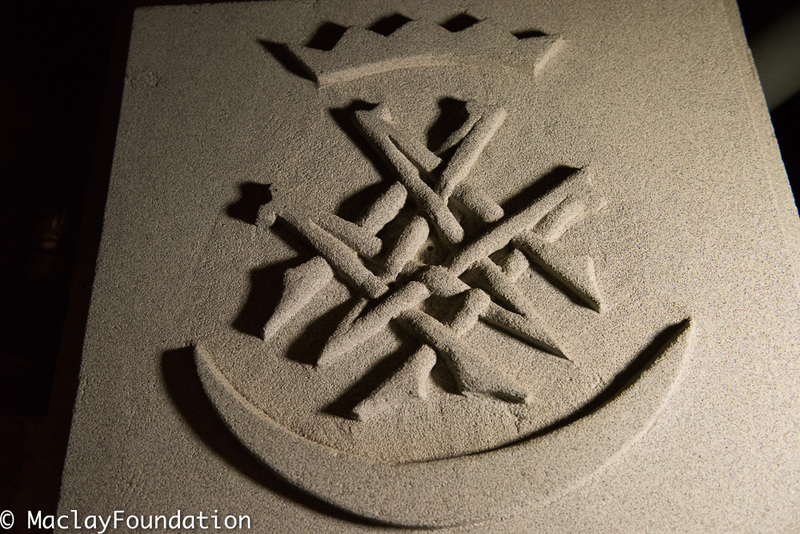 The detailed results of the expedition and diaries of the participants will be published soon on the website of the Miklouho-Maclay Foundation. The decision of Nikolai Miklouho-Maclay, a descendant and namesake of the great Russian explorer Nikolai Nikolaevich Miklouho-Maclay to organize an expedition to Papua New Guinea in the 21st Century was based on a similar motive to that which inspired his illustrious ancestor to set off for those distant coasts almost 150 years ago. 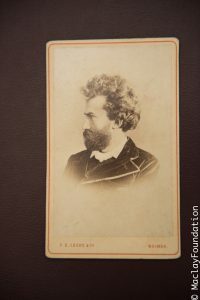 Although Russian scientists, although had available a large collection of materials collected by Miklouho-Maclay during his Papua New Guinea travels, as well as material collected later by a Soviet expedition, for over 40 years no research expedition had travelled from Russia to investigate social and cultural change in this unique spot on the planet. Ethnologist and marine biologist Nikolai Nikolaevich Miklouho-Maclay was the first to reach Papua New Guinea, well before the arrival of missionaries. He established friendly contact with the indigenous Papuans who at that time were suspicious of foreigners. Living amongst them, he made it his mission to study the traditions and culture of the people of Madang. “It seems I should first of all say why I have chosen Papua New Guinea as the goal of my travel and my explorations. While reading the descriptions of travels, I found in almost all of them insufficient descriptions of aboriginals in their original state …” wrote Maclay in his book “Travel to the Rai Coast”. 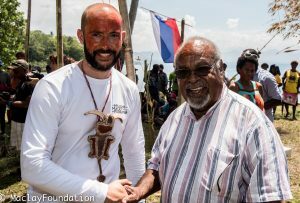 Motivated by the same goal, Miklouho-Maclay’s descendant launched his 21st Century expedition to Papua New Guinea. Having flown halfway around the world and overcome many bureaucratic and organizational challenges, the expedition team arrived in Port Moresby, the capital of Papua New Guinea on September 15, 2017. 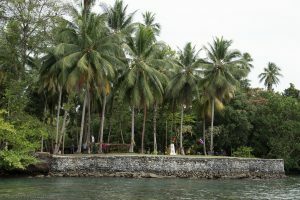 They continued on to Madang. 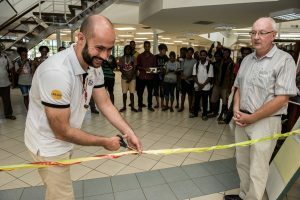 From the airport, the explorers were taken to the marina and ushered aboard the three-decked yacht “Kalibobo Spirit” and set sail to the northeastern coast of Madang, which today is named the Rai Coast, formerly known as the Maclay Coast. It was here, on September 20, 1871, that 25-year-old Miklouho-Maclay landed, after a 10-month long sea voyage from Kronstadt, Russia on the corvette “Vityaz”. Unlike N. N. Miklouho-Maclay’s first harrowing encounter with the local people, the villagers welcomed his descendant and the expedition team with great honor. Residents of the neighboring villages of Bongu, Gumbu and Gorendu, dressed in festive tribal clothes, gathered on the shore and gladly welcomed the expedition team from “Maclay’s village”, Russia, which they view as a friendly place. It was raining when the team arrived. “Maclay has come back and has called the rain” they said, rain being welcome and long-awaited. They rejoiced at meeting the members of the Russian expedition. All of Papua New Guinea heard about the visit of the descendant of Tamo boro rus, the great Russian man. 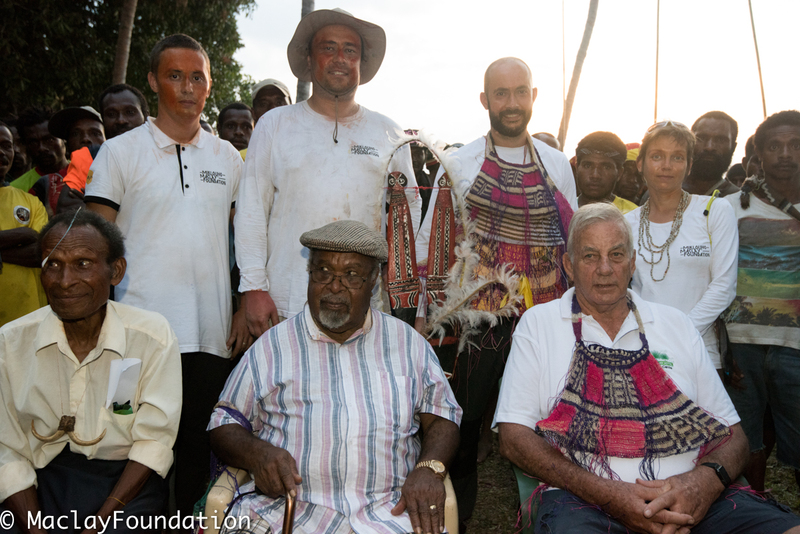 Prior to the arrival of the expedition, Sir Peter Barter, GCL Kt OBE, a well-known Australian who has lived in Papua New Guinea for over 40 years, informed the villagers of the visit, and of the young Maclay’s wish to meet the descendants of those who remembered his ancestor, Miklouho-Maclay. Sir Peter Barter, GCL Kt OBE is a great admirer of Miklouho-Maclay’s heritage. He first learned about Maclay in 1970, when Soviet sailors brought a bronze memorial plaque to the Rai Coast, and installed it on the site of Maclay’s house where the great scientist lived and worked. Every school child in Soviet Russia learnt in their history classes about the Rai Coast from geography books and Miklouho-Maclay’s diaries. They imagined that distant island in their dreams where Nikolai Nikolaevich had lived for over three years among the indigenous people. They learned how he disapproved of their unjust treatment by colonial powers, and for the rest of his life defended the rights of indigenous people to independently own their land and maintain their traditions. On September 16, 2017, there was a celebration for Papua New Guinea’s Independence Day, attended by a large number of Papuans and to which the expedition team were invited. 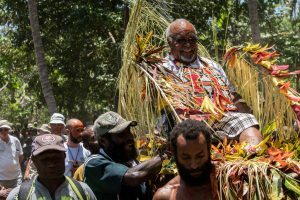 The country acquired Independence in 1975 and the Grand Chief, Sir Michael Thomas Somare GCL GCMG CH CF SSI KSG PC was the Prime Minister. He is known as the “Father of the Nation”, being the first Prime Minister to serve the country after its independence. 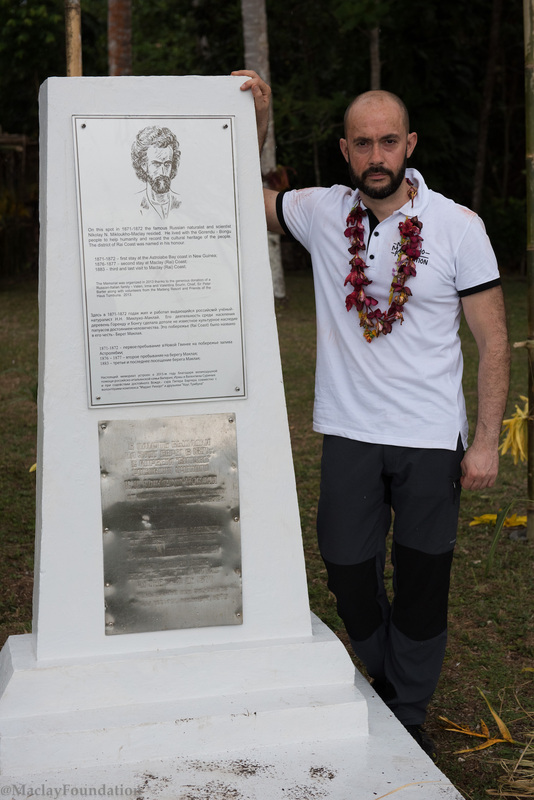 It was symbolic to celebrate this remarkable day on the Rai Coast at the Miklouho-Maclay Memorial, which is well cared-for by the local people, descendants of the Papuan, Tui, Miklouho-Maclay’s first friend. The chief of the family of Tui’s descendants, Asel, is about 70 years old now, and is a representative of the fifth generation. At the time of Tui’s first meeting with Miklouho-Maclay, Tui was about 40 years old. 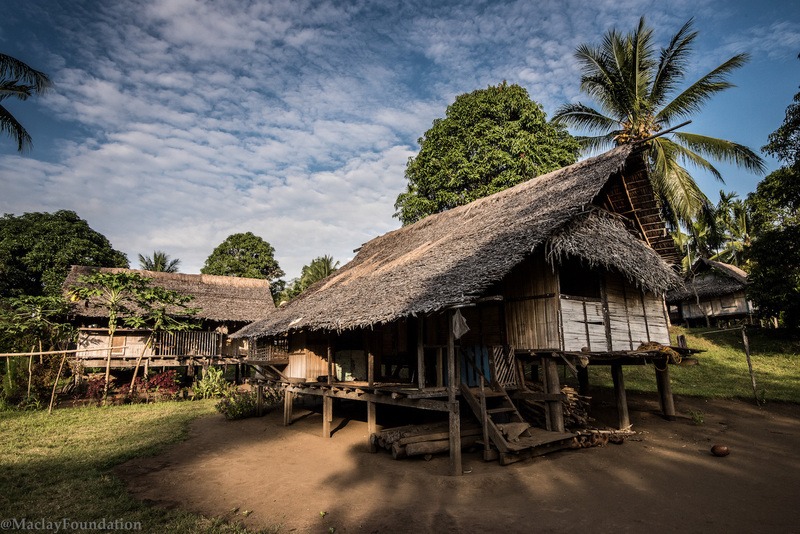 During their stay in Papua New Guinea, members of the expedition visited the villages of Gorendu, Bongu and Gumbu. They conducted research on the daily life and cultural change during the 40 years since the 1977 visit of the Russian expedition headed by Daniil Tumarkin from the N.N. Miklouho-Maclay Ethnology and Anthropology Institute of the Russian Academy of Sciences. 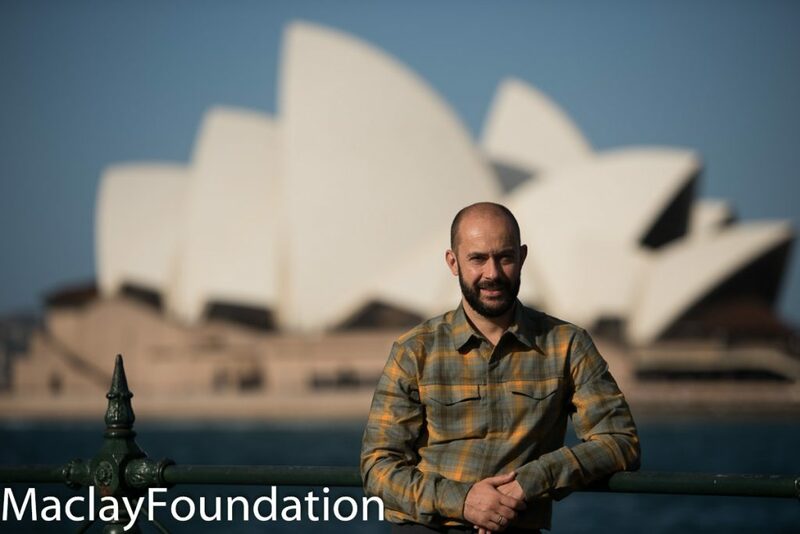 The current expedition was headed by Nikolai Miklouho-Maclay, the Director of the Miklouho-Maclay Foundation for Preservation of Ethno-Cultural Heritage. 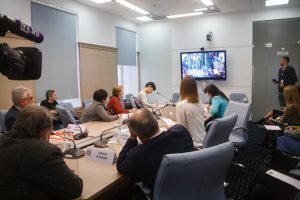 Members of the expedition team included Ms. Arina Lebedeva, a research scientist from the Peter the Great Museum of Anthropology and Ethnography (the Cabinet of Curiosities) of the Russian Academy of Sciences, and Professor Igor Chininov, the research scientist of the N.N. Miklouho-Maclay Ethnology and Anthropology Institute of the Russian Academy of Sciences, as well as the team’s photographer, Mr. Dmitri Sharomov. They were assisted by Stepan Tsergel from Irkutsk, Russia, who acted as the interpreter from Russian to Tok-Pisin. 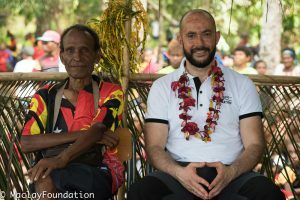 Stepan lives in Papua New Guinea and works at the Catholic mission. The expedition team appreciated Stepan’s assistance as interpreter for the expedition. To this day, memory of the great humanist is venerated on the Rai Coast. Stories of him are passed down through the generations, and even children are named after Maclay, to preserve his memory. Members of the expedition conducted interviews in the villages where practically everything that Miklouho-Maclay had written in his diaries was still evident. Literacy of local people developed with the arrival of the missionaries. However, stories of the life of the tribe are still passed on orally. The village head man in each village is responsible for this oral tradition and for teaching the younger generation. In Gorendu village, Yaboi-Tui, who is about 60 years old, is the village head man. 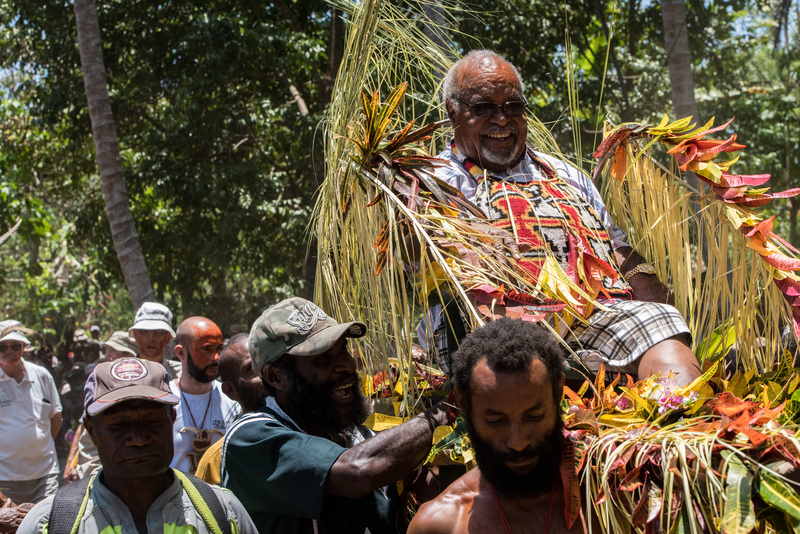 On September 20, 2017, for the first time in history, Papua New Guinea celebrated the day of Miklouho-Maclay’s landing on the north-eastern coast of the New Guinea Island. During the preparation of the expedition, the younger Miklouho-Maclay and Sir Peter Barter, GCL Kt OBE had the idea to organize a satellite TV link-up in order to connect Saint Petersburg, the city of Miklouho-Maclay’s birth, with the Garagasi Cape, where the scientist’s hut stood a century and a half year ago. At first it seemed impossible as there is almost no telecommunication on the coast. The expedition team managed to send an SMS once in a while and they had to go to the seashore even to do that. The task of connecting generations and countries across the centuries and thousands of kilometers for the Russians to see the world which Miklouho-Maclay wanted so much to show them, is comparable with the idea of connecting the satellites of the planet without special equipment. But nothing is impossible! 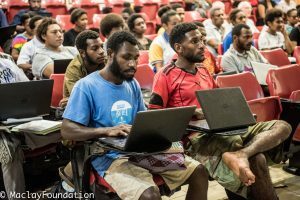 They succeeded through determination from both sides, and with the assistance of Telikom PNG, a telecommunication company of Papua New Guinea. On the part of Russia, the studio of TASS News Agency in Saint Petersburg went on air and then broadcast the news to the whole world. The Russian people were able to speak online with the participants of the celebration, and see the amazing island and its inhabitants. On that day, over 3000 local people gathered with members of the expedition and invited guests on the shore. This historic occasion was attended by lecturers and staff of the Divine Word University from Madang, representatives of public and business organizations, the Madang Community and people from various countries who work at the Catholic mission. The Grand Chief, Sir Michael Somare GCL GCMG CH CF SSI KSG PC arrived especially for the meeting with the Miklouho-Maclay’s descendant. 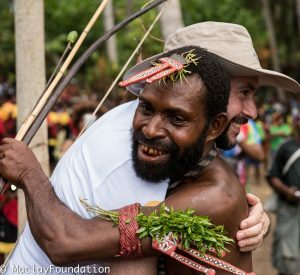 The explorer Maclay is highly regarded not only for first contact of an outsider with the indigenous people of New Guinea, but also for being the first white man who fought for their rights and who considered the local people to be equal to the Europeans. The “Father of the Nation” expressed his greeting as a sign of his respect and wish to cooperate with the Russian folk. His Excellency, Ambassador M.Yu. Galuzin, the Russian Ambassador to Indonesia and Papua New Guinea, was invited to participate in the event. Although he was unable to attend the celebration he sent a letter greeting all the participants. 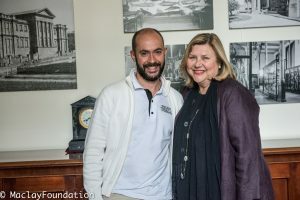 The grand celebration of the 146th anniversary of the landing of Nikolai Miklouho-Maclay coincided with the 44th birthday of his descendant and namesake. This was commemorated with the laying of soil from Miklouho-Maclay’s motherland, the Yazykovo-Rozhdestvenskoe village, not far from Okulovka, in the Novgorod region, at the Memorial Plaque in his honor. 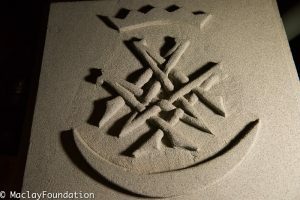 The memorial plaque, just like the coastline, was restored thanks to the efforts and funds from Sir Peter Barter, GCL Kt OBE and from the Russian-Italian family of Surins who still remember Miklouho-Maclay from their school curriculum. Asel, the chief of the family descended from the Papuan Tui, also took part in the ceremony. Another momentous event on September 22, 2017 was the opening of the photographic exhibition at the Divine Word University in Madang, with a presentation of photographs of Miklouho-Maclay’s objects and drawings from the collection of Peter the Great’s Museum of Anthropology and Ethnography (the Cabinet of Curiosities) of the Russian Academy of Sciences were presented. 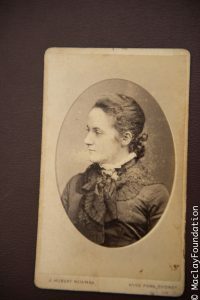 There were also photographs of objects from the collections of the expedition headed by Daniil Tumarkin, which are kept today at the N.N. Miklouho-Maclay Ethnology and Anthropology Institute of the Russian Academy of Sciences. This symbolic return of the unique exhibit items to the motherland after almost 150 years was the subject of Maclay’s the young Nikolai Miklouho-Maclay’s speech in a meeting with the students from the University. 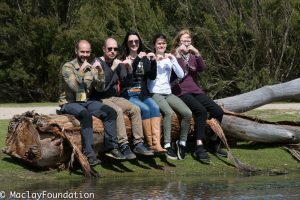 The expedition team spent September 24 and 25 in Port Moresby where they visited the National Botanical Park, the National Library, the National Museum. Nikolai the younger gave a speech at the University of Papua New Guinea about the expedition and further plans concerning cooperation with the University. Thanks to the administration of the University and efforts of the team, a public exhibition of photographs, objects and books about Miklouho-Maclay from the collection of the University’s library was held especially for the visit of expedition members from Russia. In 2017-2018, the summit of the Asia-Pacific Economic Cooperation will be held in the capital of the Papua New Guinea, comprising a gathering of representatives from over 40% of the world’s economies. For that significant event the University plans to organize an exhibition and to republish the book Travel to the Rai Coast, by N.N. Miklouho-Maclay. The Miklouho-Maclay Foundation which organized the exhibition and has a large collection of photographs and video materials, plans to join the project and show a documentary film and exhibition of photographs to the participants of the summit. The next point of the route was the city of Sydney, Australia where the expedition team arrived on September 26. Some direct descendants of the great Russian scientist live in Sydney, Melbourne and other parts of Australia today. 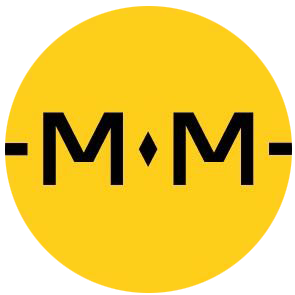 Miklouho-Maclay’s surname is connected inextricably with Australia. 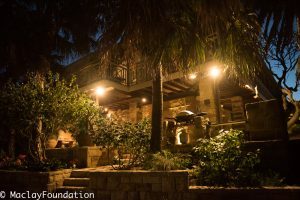 Nikolai Nikolaevich lived and worked in Sydney, where he founded the first marine biological station at Watson’s Bay which was an important focus for the study of the marine flora and fauna. In Sydney Nikolai Nikolaevich married Margaret Robertson Clark, the daughter of the Premier of New South Wales, Sir John Robertson, a great patriot of Australia. A statue of Sir John ‘Jack’ Robertson can be seen in the Sydney Domain, opposite the Art Gallery of New South Wales. Australia indeed became Miklouho-Maclay’s second home. 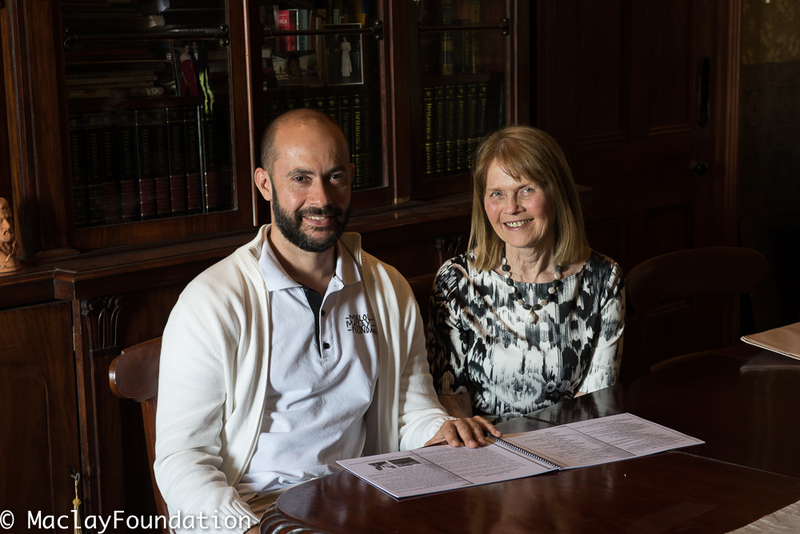 The first long-awaited meeting of the young Miklouho-Maclay with Janie Maclay, the widow of Paul Maclay, the grandson of N. N. Miklouho-Maclay, took place in Sydney. 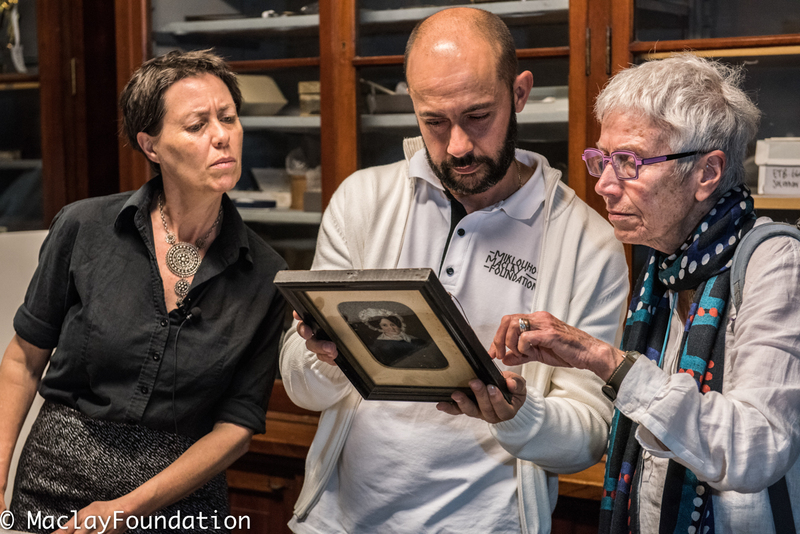 During their stay in Sydney, the expedition team visited Sydney University, and received a hearty welcome by Jude Philp, Senior Curator of the University’s Macleay Museum, where they viewed the emblem of the Miklouho-Maclay family, as well as valuable scientific material. They visited the ‘Museum of Sydney’, which celebrated its 190th anniversary this year. It was here (at the invitation of his friend and Director of the Museum, William Macleay) that N.N. 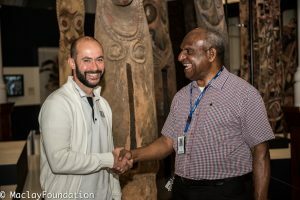 Miklouho-Maclay worked, helping to curate the museum’s vast collection of over 62 thousand artefacts and cultural materials connected with Papua New Guinea. 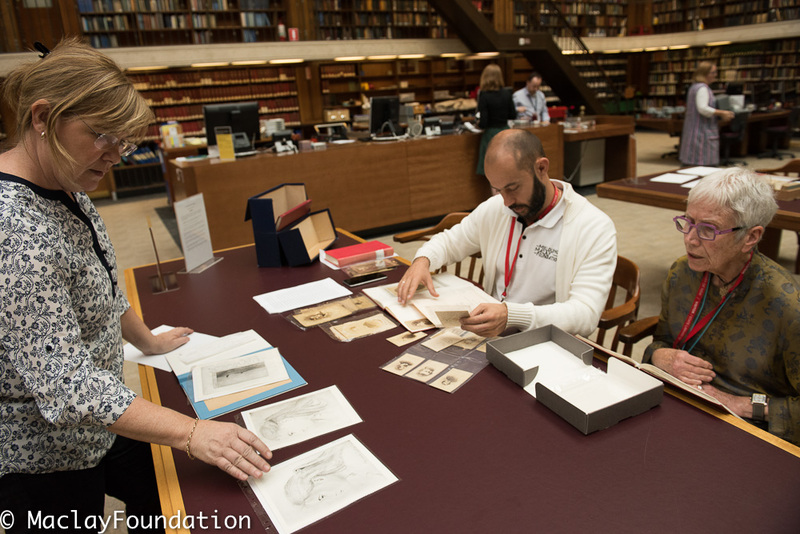 The Director of the Museum, Alois Kuaso, welcomed the members of expedition and showed them the main collections connected with the Oceania and the region of New Guinea where Miklouho-Maclay lived and researched. He was familiar with Nikolai Nikolaevich’s time in Australia and the meeting with him came about through the kind support and assistance of Sir Peter Tesch (the Australian Ambassador in Russia) – Sir Peter offered his help because this particular part of our history and culture, unites Russia and Australia in many ways. 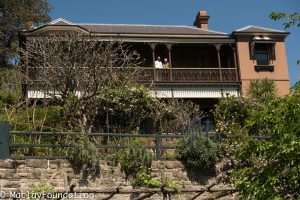 The young Miklouho-Maclay visited the house of his ancestor on Sydney Harbour at Snails Bay, Birchgrove. The house has been perfectly preserved, thanks to the Sullivan family, who, with other Community Members, saved the house from ‘Developers’. The Sullivans then bought ‘Wyoming’ and restored it. 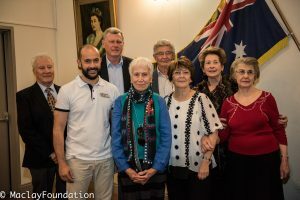 Janette and Colin Sullivan, again with other Community Members, persuaded Local Council to name a nearby slice of parkland, ‘Miklouho – Maclay Park’: honoring once more, the great Russian ethnographer, who etched his name into the history of Australia. 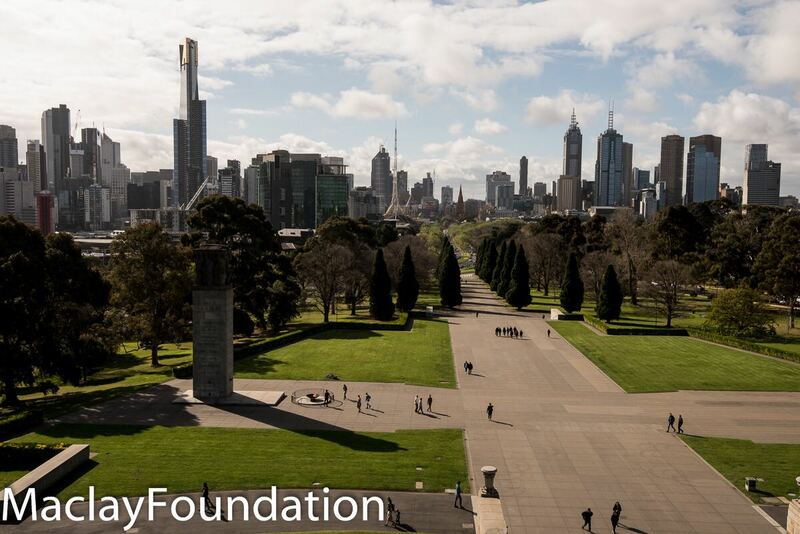 Today the house is under protection of the state as an important part of Sydney’s heritage. The expedition team visited the Mitchell Library where they viewed the portrait of N. N. Miklouho-Maclay by A. Korzukhin, painted in 1886 in Sydney two years before the death of Nikolai Nikolaevich. The portrait is only occasionally publicly exhibited, but the family members were given special access. There they also found documents confirming that the coast where Miklouho-Maclay landed in 1871 was named the Maclay Coast by the first Europeans who arrived there. Based on these documents, the official restoration of the historical name on the maps of the Papua New Guinea is possible. Leader of the New Guinea expedition Maclay was invited to the First Russian Museum of Australia where he met members of the Russian Community in Sydney, and showed them the unique photographs and video materials he and his team had recorded in Papua New Guinea. The meeting, with traditional Russian hospitality, was organized by the founder of the Museum, Mikhail Ovchinnikov. The Senior Consul of the Russian Consulate in Australia, Nikolai Nikolaevich Vinogradov, attended the meeting, and gave a welcome speech to the members of the expedition. He also pointed out how the Russians in Australia carefully maintain their traditions, which is a good example for Russians living in Russia. 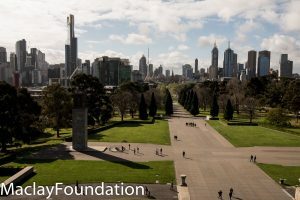 The last destination on their itinerary was Melbourne, the second largest city in Australia, where the expedition team arrived on October 2, 2017. The “Russian Melbourne” program awaited the members of expedition here. 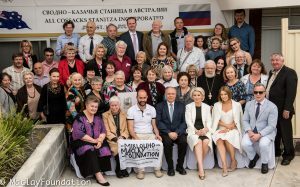 With the assistance of the Russian community and Vera Kalashnikova, meetings were held with members of the Russian community and with members of the Miklouho-Maclay descendants of who live in Melbourne. One of the results became the decision of the family of Miklouho-Maclays to open a branch of the Miklouho-Maclay Foundation in Australia. And that is very timely and reasonable, since there proved to be many of those who wish to learn more about Miklouho-Maclay’s heritage, about his works and his history infusing with history of Australia, and there is not enough information about that now. N. N, Miklouho-Maclay is a good example for all the young people in the world. His firm temper, consistency of aim, decency, and commitment to the principles of humanity once made him the hero of many books in the Soviet Union. In the period after the Second World War, two films were produced about him, five- and six-volume editions of his diaries were published, and of course the books about him were very popular and interesting for many people. Boys in Russia strived to be like him. His courage and ability to communicate with people from different walks of life impressed such literary figures as Leo Tolstoy and Ivan Turgenev, who corresponded with him. He was also well known and respected by the Russian Imperial Family, who supported his costly projects. Later, after his death, in 1888 they undertook to pay 5000 roubles to his family for life, in honor of his contributions to science. There is an interesting story about the marriage of Nikolai Nikolaevich with Margaret Robertson Clark. It was possible thanks to the expression of will of the Czar Aleksander III and of the Holy Synod. The difficulty then was that Miklouho-Maclay did not want to change his faith. He was Russian, and therefore Orthodox, but in order to marry his beloved Margaret (Rita) he had to fulfill a seemingly impossible condition set by her father – a marriage ceremony according to the Catholic tradition. And Miklouho-Maclay got approval for that! Nothing was impossible for him. “One can judge a man by his goals”, is one of the principles of Miklouho-Maclay. Margaret and their two sons, Vladimir and Aleksander, returned to Sydney, Australia from their home in St. Petersburg, Russia after Nikolai’s death. 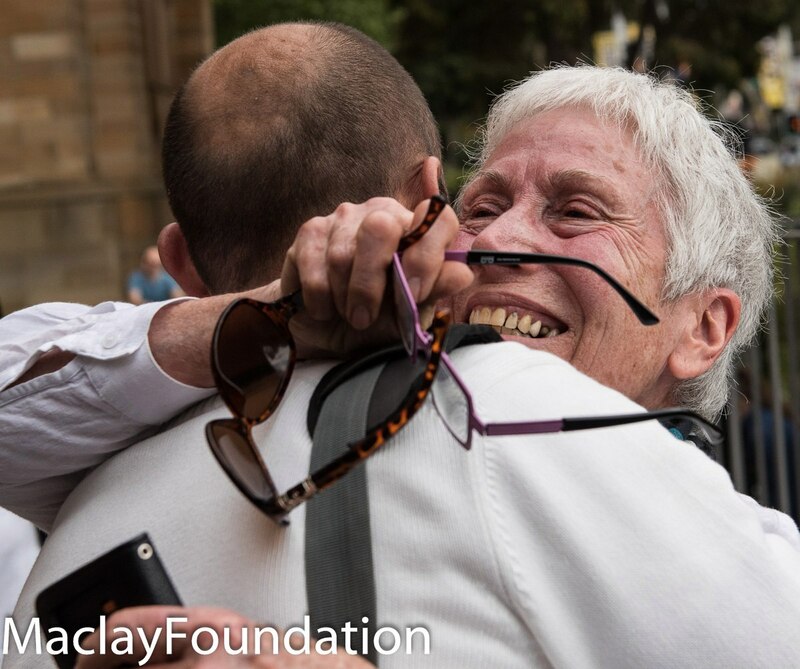 Now there are two branches of Maclays – Australian and Russian. The Russian branch begins from Nikolai’s elder brother, Sergei, who was born in the Novgorod province, like Nikolai, during the time when their father worked on construction of the Saint Petersburg – Moscow railway. Later he was appointed the first director of the Nikolaevski (Moscow) Station in Sankt-Petersburg. The cherished memory of Nikolai Nikolaevich Miklouho-Maclay is still strong in Russia and Papua New Guinea. It is certainly symbolic that his descendant from Russia, who also bears the same name and patronymic, journeyed to Papua New Guinea and Australia to remind the world about the achievements of the “Citizen of the World”, the title awarded to Nikolai Nikolaevich Miklouho-Maclay by UNESCO in 1996, the year his 150th anniversary was celebrated. Nikolay Miklouho-Maclay was the first in the Maclay family since his ancestor Maclay to visit the island, where after a century and a half, the memory the great explorer-humanist is deeply etched. The goals of the expedition were to establish cultural connections and cooperation with the leading universities of Papua New Guinea and Australia, carry out scientific research, and conduct a study of the cultural dynamics of the people of the Rai Coast over the past forty years. The results of this research are being processed and will be presented to the scientific world and the wider public. Unique photographs and video materials were collected during the expedition and these will form the basis for a documentary film. As a result of the expedition, photographic exhibitions, joint exhibitions of materials from the reserve collections of the Cabinet of Curiosities collected almost 150 years ago, and collections from the past expedition are being organized in various places in Saint Petersburg and Russia. 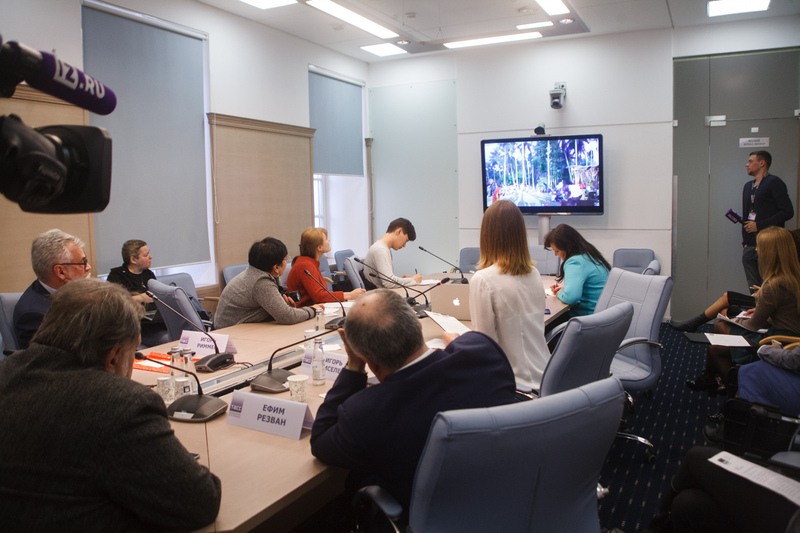 A series of visits to the leading universities of Russia are also being organized. 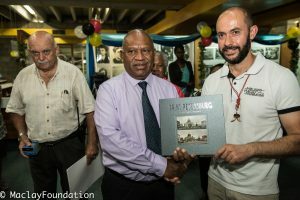 Joint events with the institutions of Papua New Guinea and Australia are being prepared and unique collection of photo albums will be published. One more result of the expedition was the agreement about opening a new trend of ethno- and eco-tourism for Russian visitors. The hospitality of Papua New Guinea is now closer and safer for Russians and citizens of the whole world, and the Miklouho-Maclay Foundation is a recommended guide to this unique region of the world for all travelers. Now you can relive the history not only through books and films but also as a traveler on the Rai Coast with the Russian explorer’s descendant, if you are fortunate enough participate in his next expedition.